A waterless car wash is a high lubricity pre-mixed spray detailer that is used to heavily saturate a panel and then you carefully wipe any dirt or road grime off to a dry shine. 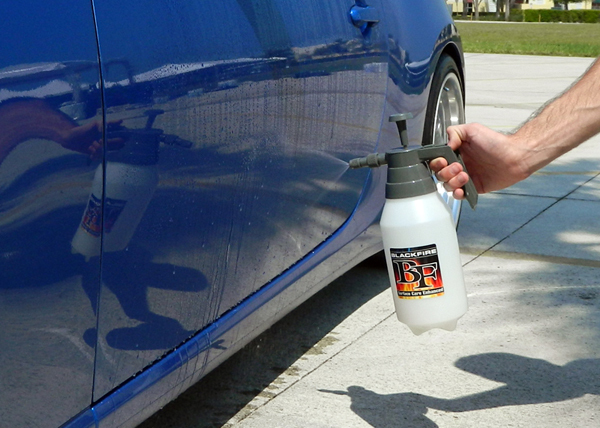 Waterless washes should only be used on vehicles with light dirt accumulation. They’re a fast way to clean your vehicle between washes. You can choose from ready-to-use formulas, like Pinnacle Liquid Crystal Waterless Wash with Carnauba and McKee's 37 Waterless Wash On The Go, or you can opt for a concentrate, like Pinnacle Liquid Crystal Waterless Wash Concentrate with Carnauba and McKee's 37 Waterless Wash On The Go Concentrate. The most concentrated waterless wash available is BLACKFIRE Wet Diamond Waterless Wash Concentrate. A waterless wash with a built-in wax, like Pinnacle Liquid Crystal Waterelss Wash with Carnauba, adds protection as you wash your vehicle. BLACKFIRE takes a similar approach with their Wet Diamond Waterless Wash, except it adds super slippery polymers. Choose your waterless washing towels carefully. A very soft towel with a deep nap provides ample room for dirt to accumulate in the towel, rather than being rubbed against the paint. A thin towel with a flat weave or nap will not provide anywhere for loosened dirt to go, so it will be rubbed against the paint as you wipe. Good towel choices are the Shine & Buff Waterless Wash Towel or the Cobra Supreme 530 Microfiber Towel. The key to working safely with a waterless car wash is to use plenty of clean, microfiber polishing towels. Fold your towel in half and then in half again, creating 8 sides. After using all 8 sides of a microfiber towel, quit using the microfiber towel and switch to a new, clean microfiber towel so you don't simply transfer dirt removed from one panel to another panel. Fold your towel so there are 8 usable sides. 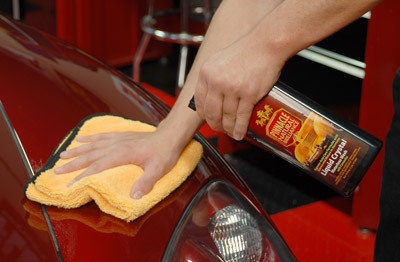 Starting at the top of the vehicle (the cleanest part), spray a panel generously with your waterless wash. The size of the panel depends on how large an area you can spray and wipe dry before it dries on its own. Generally speaking, half the roof or half the hood is a good size section. Wipe lightly in one direction. There’s no need to apply significant pressure and doing so can result in micro scratches. Note: If you wipe in a circular motion, you’re wiping the dirt you’ve just removed back over the section you’ve just cleaned. It’s counterproductive. As you’re wiping, pay attention to the cleanliness of the towel. When one side becomes soiled, switch to a new side of the towel. Remember, you’ve got 8 sides to work with and hopefully some extra towels, too. Wipe the section completely dry and move on to the next section. Speed up the process by using your waterless wash of choice in one of our 48 ounce Chemical Resistant Pressure Sprayers! Slicing your car up into sections. Rear Bumpers and Rear Vertical Panels like you find on SUV's, some passenger cars or for example, the tailgates on trucks. Lower Vertical Panels - Now do the lower portions of the vertical panels, these are the dirtiest sections. Lastly, the wheels. Important! Do not use the same towel to detail your wheels that you use on your paint! The wheels are covered in brake dust and you cannot risk transferring it back to the paint finish. Designate towels just for wheels, like our Microfiber All Purpose & Wheel Detailing Towel.